Digital UltraViolet and Digital Copy will makes it possible for you to stream the movie The Upside HD iTunes Code instantly to your computer and compatible Smartphones, Andriod, iphone, iPod Touch, iPad and tablets devices anytime, anywhere. You can also download a Digital UltraViolet Copy or a Digital Copy of the movie The Upside HD iTunes Code to your computer and compatible devices. 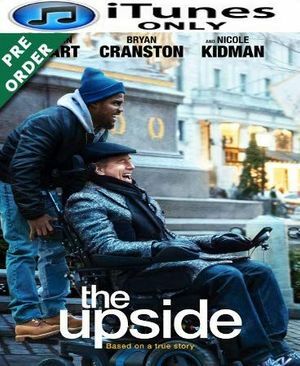 Inspired by a true story, THE UPSIDE is director Neil Burger�s heartfelt comedy about a recently paroled ex-convict (Kevin Hart) who strikes up an unlikely friendship with a paralyzed billionaire (Bryan Cranston). The film also stars Nicole Kidman, Julianna Margulies and Aja Naomi King.